I'm an anime otaku who has tons of anime movies in MKV format and want to play these MKV videos on my iPhone/iPad anywhere and anytime. Also I want my friends to watch these MKV videos without copying/pasting or uploading to video sharing websites. What's your way to play MKV on iPhone iPad? Spending hours in converting MKV videos to H.264, the HD video codec supported on iPhone iPad and other Apple devices for keeping a high quality via a HD video converter, and then syncing to iPhone iPad via iTunes? You are definitely OUT! What's more, a .mkv file has large file size, so your iPhone iPad can only store a fraction of your MKV video collections. The way IN is that streaming MKV videos to iPhone iPad from your Mac or PC hard drive and playing MKV videos on iPhone iPad wirelessly without waiting. There's no need to copy the converted MKV videos to your iPhone iPad, so no internal memory of iPhone iPad will be taken. Meanwhile, you can share your MKV collections with friends by giving them access to your computer hard drive. 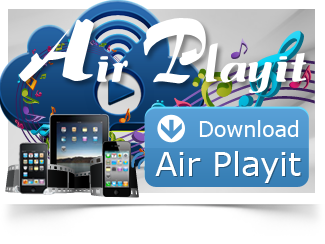 Help is at hand with Air Playit app. Air Playit is a free video streaming app which is capable of streaming MKV videos to iPhone iPad from Mac or PC without using video converter software. Air Playit supports Live Conversion that rescues you from tedious and lengthy format conversion. It allows you to stream MKV videos on the fly and makes them instantly playable on iPhone iPad via Wi-Fi, 3G or 4G. Besides streaming and playing MKV to iPhone iPad in a breeze, this app also supports streaming AVI, FLV, MP4, MOV, M2TS, etc. to iPhone iPad over air. How to Play MKV Videos on iPhone iPad with Air Playit? 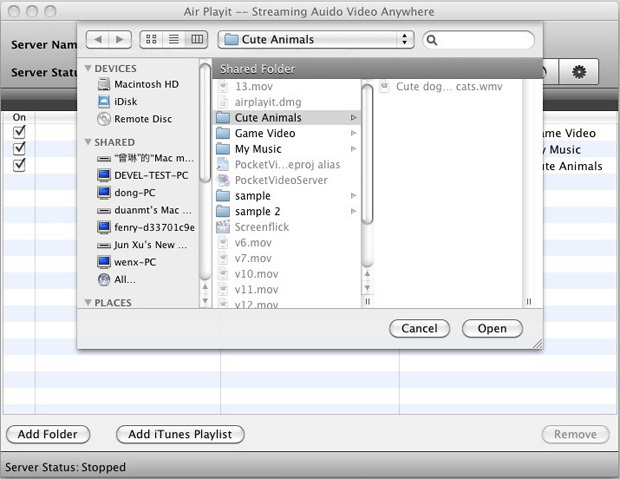 Tips: Air Playit server will stream MKV or other videos to your iPhone iPad from the sharing folder, so you can watch videos on iPhone iPad anywhere. 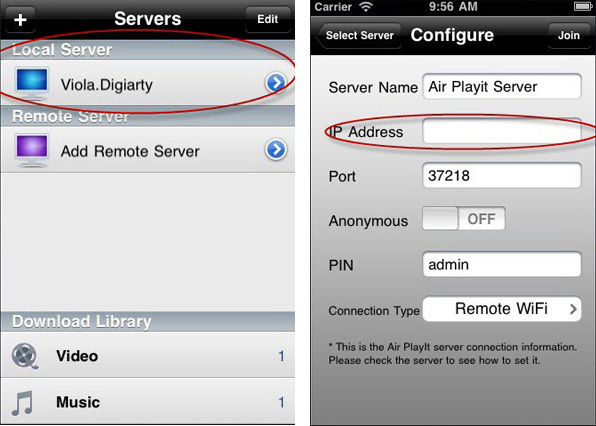 Note:Air Playit can automatically discover the server over local Wi-Fi, 3G or 4G networks by Apple Bonjour Service. If you need to stream MKV to iPhone iPad over remote network, you should add the remote server to your server list by manually specifying IP address. Air Playit will stream MKV videos to iPhone iPad instantly by Live Converting via Wi-Fi-, 3G or 4G. So you can play MKV on iPhone iPad without any waiting. Besides, you can also apply Offline conversion. Now the app works as a remote MKV video converter. 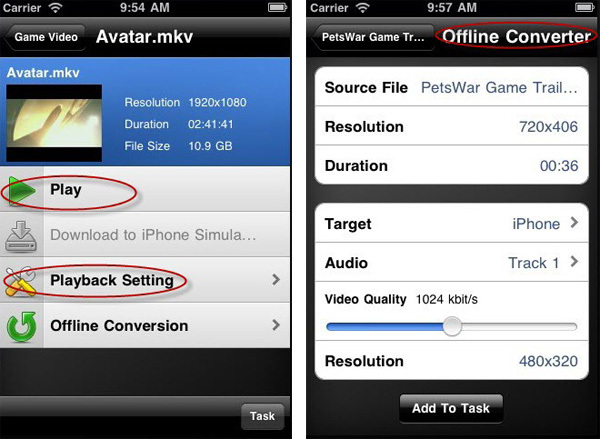 The built-in offline task manager enables you to add and manage video conversion tasks on your iPhone iPad, and then download converted videos. So you can play converted MKV videos on iPhone iPad later when no network is accessible. All in all, Air Playit rescues you from tedious MKV video conversion by simply streaming MKV videos to iPhone iPad wirelessly. Air Playit is a free video streaming app which supports streaming MKV videos to Android phones over Wi-Fi, 3G/4G networks. With this Android video streaming app, you can watch MKV video on Android wherever you are.